Ive been so pleased with the lovely comments and and followers Ive gathered in just a couple of days, its ace :) Tonight Im sat in my dressing gown with my heat-able monkey pressed against my stomach, dying of both the lack of heating in my tiny little uni room, and hideous stomach cramps! The joys of being a woman hey... I'm cheering myself up however by watching Sabrina the Teenage Witch (I have all 7 series...) with a little pot of hummus and some pitta bread (the healthy option) and some Marks and Spencers mini bites (the not so healthy option). For some reason the fact that they're mini seems to make me think theyre not bad for me?! So, thought I'd just do a little post tonight based on the shopping I did the other day. I stayed at my boyfriends, and after I left, had to pop to the shops to pick up some hair bleach. Im in the process of ombre-ing my hair. Because it's been so many millions of colours its taking a while to lighten. ANYWAY, after I'd raided Boots (and managed to somehow spend £25), I decided to pop into a couple of shops for a little browse. Im going to dedicate a whole post just to Primark, and do the rest (makeup and Topshop) tomorrow, because I really did find some amazing bargains in Primarni today. By the way, sorry about my face, I look so dishevelled! 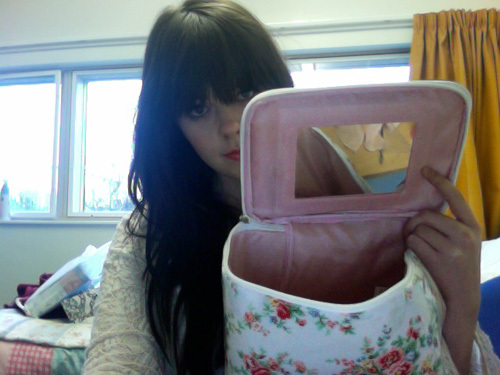 First is this super super SUUUPER cute vanity case which was £4.50! I couldnt believe how cheap this was. 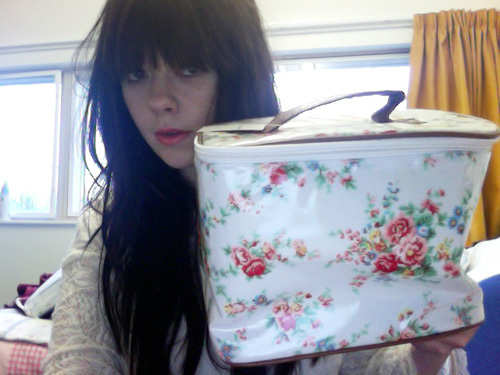 I'm using it to store all my extra bits of makeup in that I dont keep in my everyday makeup case. The fabric on the outside is waxed plastic so its wipeable which is great if youre as clumsy as me. I love the little mirror inside as well, so handy! 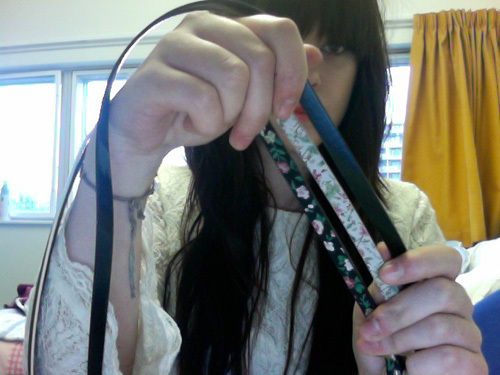 Next is this little trio of skinny belts which were a whole £2, absolute rip off... OH WAIT. What a bargain! I only bought them for the two floral ones really as the plain one looks a little cheap. River Island sold a belt of a similar pattern to the black one which I lusted over for ages but decided I couldn't afford, so when I saw these I just couldn't say no. To be honest this looks hideous in this photograph but honestly its really pretty. 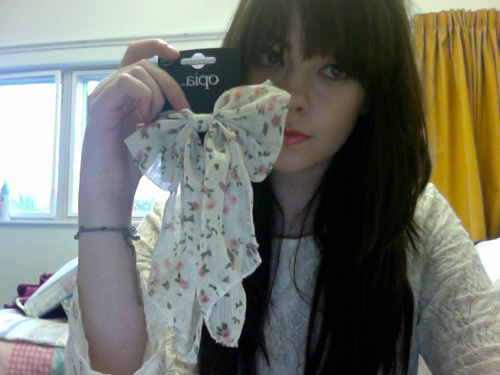 A while ago I bought a baby pink bow like this from Primark but it was on a brooch fastening, which I turned into a hairbow, and Ive worn it so much and get complimented on it quite a lot. I like wearing one or two really girly accessories with more edgy outfits to give them a subtle girly touch, so when I saw this little floral version I thought why not, I think it was only £2. Each of these adorable necklaces were only £1.50! The first has a tiny pink rose and the sweetest little gold rocking horse, and the second has a matching white and blue teapot and teacup. 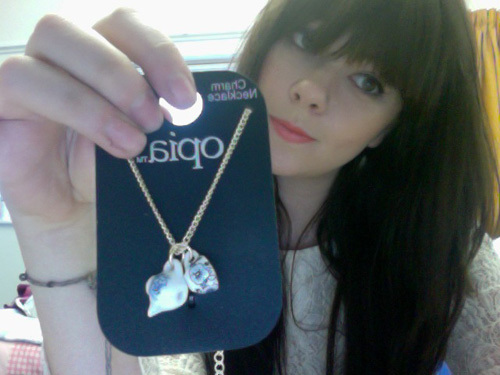 I've been wearing them both together today and they look so cute, they're so dainty. 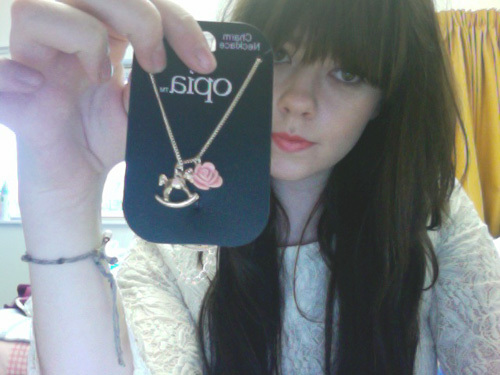 I looove cute necklaces like this, my favourite is a little gold locket in the shape of a book that my brother bought me for christmas. Primark clothes dont tend to look all that great on me, they never seem to fit my frame very well. There were a couple of undies sets that caught my eye but they didnt have my size, sad Lucy. Oh well, I was dead pleased with this little mini haul! Harvey digs Sabrina haha! Me and my sisters used to love Sabrina the teenage witch...Hilda, Zelda,Valarie & Mr Kraft!